The underground emitter box, or "mulch shield" is used to create a subsurface irrigation area, where the greywater can flow out into the mulch. The air gap between the outlet and the mulch prevents roots from growing back into the pipe and clogging the system. You'll need to drill your own hole for the greywater tube to enter the valve box. You will most often want this to be just about 2 inches below the lid. 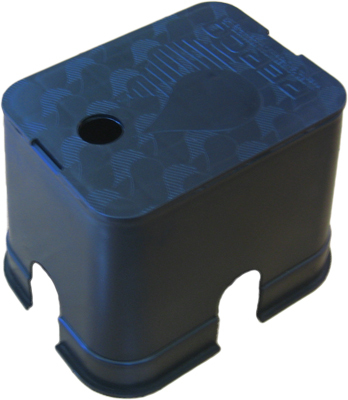 The valve box, or "mulch shield" should be sitting on top of a thick (4-6") layer of mulch. You can also make your own emitter out of a 1 gallon plastic pot. Just cut a lid, and drill a hole in the side for the greywater tube to enter. You can put a paving stone on top to protect it. Home made valve boxes are not as sturdy as purchased ones, so if it's located in a high traffic area you'll probably want to use a purchased valve box.